St. Francis of Assisi School maintains a dress code because we believe it fosters school identity and pride in one’s self; it minimizes fashion competition and distractions; it teaches the value of appropriate dress; and it is an economical solution to expensive clothes. Students are to be in full uniform when school is in session. Uniforms are to be worn to and from school. Uniforms should be clean, free of holes, and should fit properly. Parents will be asked to update or replace uniforms that do not fit properly. A student who is out of uniform for a legitimate reason must bring a note from a parent or guardian. Students who do not abide by the dress code will receive a uniform slip, and repeated offenses may result in disciplinary action. When students are attending field trips they will be expected to wear their uniforms unless otherwise instructed. Preschool students do not wear uniforms. They should wear comfortable play clothes that do not interfere with full participation. Low-heeled shoes that fully enclose the heel and toes are required. All Students: The standard uniform may be worn year-round. Summer options (listed below) are permitted during Daylight Savings Time. Navy Blue or White Socks which must cover the ankles. (Optional) Navy Blue sweaters with the school’s logo, which must be purchased from Flynn & O’Hara or Lands End only. Three options are available. Sweatshirts or jackets may not be worn in the classroom. Girls - Uniform Jumper ( knee- length) OR long khaki dress slacks from Flynn & O’Hara or Lands End with a white Peter Pan collared blouse. Black or brown belt. Shirt must remain tucked into the pants. Boys - Navy blue pants from Flynn & O’Hara or Lands End with a white buttoned down collared shirt. (School Logo is not required on the white shirt, but no other logos are acceptable.) Black or brown belt. Shirt must remain tucked into the pants. Navy blue ties are required (except for Kindergarten). Girls - Uniform skirts (knee-length) OR long khaki dress slacks from Flynn & O’Hara or Lands End with a white buttoned down collared blouse. Black or brown belt. Shirt must remain tucked into the pants or skirt. Boys - Navy blue pants from Flynn & O’Hara or Lands End with a white buttoned down collared shirt. (School Logo is not required but no other logos are acceptable.) Black or Brown Belt. Shirt must remain tucked into the pants. Navy blue ties are required. 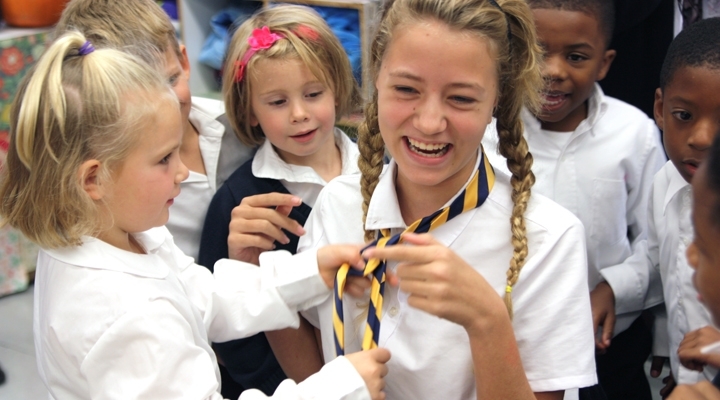 NOTE: A class tie, approved by the school, may be included for both boys and girls in 8th grade. Khaki walking shorts, purchased from Flynn & O’Hara or Lands End, may be worn in place of the dress uniform by both boys and girls. Black or brown belt. Shorts must fit properly and come to the top of the knee or longer. Standard uniform pieces may still be worn during the warm weather months, including mix/match with summer options. (e.g. A summer polo shirt with regular blue pants is allowed). Spirit Wear, including SOAR Shirts, are allowed on spirit days only. NOTE: If students do not bring the PE uniform appropriate to the weather and the planned activities for that day, they may be kept indoors. Uniforms should be neat and clean and shirts are to be tucked in at all times. Tee shirts worn underneath must be plain white, short sleeved in length and tucked into slacks or skirts. Clothing must not be tight or revealing. Undergarments should not be seen. Hats are not to be worn in the building. Bandanas and similar hair decorations are not permitted. Simple headbands may be worn. Colored and artificial nails are not permitted. Only clear nail polish is acceptable. Tattoos, makeup, and body piercings are not permitted. Writing on skin is not acceptable. HAIRSTYLES: Because our dress code seeks to minimize fashion competition and distractions, we discourage elaborate hairstyles. Hair should be simple, neat, clean, combed, and kept in good taste. Hair grooming should not take place during school hours. Hairstyles must not distract from the learning environment or impede the vision of fellow students. Boys: Length may not exceed the top of the collar, the top of the ears, or go beyond the eyebrows. No trends such as Mohawks, coloring, or designs shaved into the head will be permitted. A gradual/natural fade on the sides is allowed. Girls: Length may not exceed the waist. Hair should be the student’s own natural color. Extensions that feature embedded decorations or artificial colors are not allowed. Hair accessories should be functional, and should not interfere with learning. Simple headbands, such as uniform plaid or plain dark colors, are preferred. Girls may wear one stud earring on each ear. Dangling earrings/hoops are not allowed. Other piercings are not permitted above the neck. Bracelets and necklaces are not permitted. A small religious symbol may be worn around the neck but must be worn underneath the shirt. One simple ring is permitted. A simple watch is permitted. Electronic devices worn as watches are subject to the Acceptable Use Policy (AUP) found elsewhere in this Handbook. All restrictions on jewelry, hair, and make-up remain in effect for dress down days. Some accessories may be permitted in line with the theme of the dress down day. Teachers reserve the right to tell a child to take off accessories that are a distraction. Students may wear jeans, pants, sweats, or capri pants. Skirts, dresses, shorts must go to the knee. Leggings must be covered by a skirt or dress that goes to the knee. Shirts must fully cover the stomach and chest areas. Clothing should not be snug-fitting or revealing. No tank tops, spaghetti straps, or bare midriffs are permitted. Leggings and tight jeans/pants are not permitted unless layered under other clothing, in which case, the top layer must reach the knee. Clothing should not have holes or tears, even if that is part of the design. If there is writing or a logo on the clothing , it must be in good taste. No pants or skirts that have writing on the back are permitted. Shoes worn for dress-down must be close-toed with a heel of no more than one inch.